Only a week away from my Dunoon Burgh Hall gig. Have a Valentine night out celebrating 90 years to the day since Mississippi John Hurt’s 1928 recordings in Memphis. 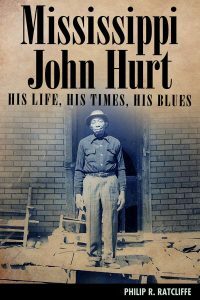 Mississippi John Hurt is a legendary figure in the Country blues who first recorded on 14th February, 1928, exactly ninety years ago to the day from the date of this presentation. His repertoire included blues, spirituals, ballads, and ragtime tunes. It is lively, rhythmic and very easy to listen to, and continues to attract new audiences. But, Mississippi John Hurt had a great deal more to offer the world than just his music. This multi-media presentation, accompanied by story-telling and music performances by Dr Phil, tells the fascinating and often humorous story of John Hurt from his birth to freed slaves, through the trials and tribulations of being black in rural Mississippi in the first half of the last century, to his initial discovery in 1928 and subsequent rediscovery in 1963. The presentation also features the playing of rare examples of Mississippi John Hurt’s original 78 rpm records from 1928 played on a 1920s wind-up Victrola phonograph. The presentation will be followed by a concert focussing on the music of Mississippi John Hurt.